The development of Closed Loop Fuel Injection began back in the 1970s and was born from automobiles polluting the environment for the previous 70years. A precise method of fuel delivery was needed to meet new limits in the pollution from automobiles because the EGR valve, pellet style catalytic converters and pollution pumps just weren't enough. Though it's been around for 30 yrs, its basic function is fairly simple and yet most still don't understand it.. In basic principal, there's a brain (aka the ECU - Electronic Control Unit), a high-pressure fuel delivery system, an electronic valve -the injector, and an information source- the O2 sensor. While that is it's simple form, add a handful of sensors, a large wiring harness and you've almost completed today's CLFI system. Why is all this needed? First some theory. The theoretically optimal air fuel ratio is 14.7 pounds of air for every pound of fuel. At this ratio, theoretically, all available oxygen in the air combines with all available fuel. This ratio is called the stoichiometric ratio. The measurement Lambda is the measurement that represents ithe actual air fuel ratio over the stoichiometric ratio. A Lambda measurement of "1" equates to the air fuel ratio of 14.7 (for gasoline engines). When Lambda is less than 1, the engine runs "rich", i.e., unburned fuel exists in the exhaust. If Lambda is greater than 1 the engine runs lean, i.e., free oxygen (O2) is present in the exhaust. For most engines, maximum power is typically delivered when the engine runs slightly rich (for example at Lambda values of 0.8 to 0.9) or a/f ratios around 13.0:1. This stoichiometric ratio was known prior to the development of closed loop systems but an accurate and reliable means of real time measurement had not yet been achieved. Then, in the late1970's, Bosch produced such a device called an O2 sensor that was able to sense the real time content of O2 (oxygen). Connected to an electronic mixture control valve, we had the beginning of electronic fuel metering. 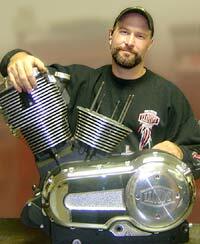 These first systems of this were used in carbureted vehicles in the early 1980's. In today's systems the O2 sensor provides a means to measure the actual air fuel ratio (or Lambda) in the engine directly from the exhaust and relay that information back to the ECU (See photo) to adjust the fuel mixture in real-time. This is called closed loop control. Originally, all O2 sensors developed were the narrow band type (as pictured) and were referred to as a 14.7:1 switch. A narrow band sensor can only accurately measure O2 levels between 14.5-15.2:1 and it cycles up and down to do this. By cycling, I mean the switch either reads rich or lean depending on amount of O2 it senses in relation to the 14.7 a/f ratio. For instance, by measuring a bike exhaust real time with narrow band sensors ,you will see a cycling or "hunting" of the 14.7:1. It never holds a true value in the process. As shown below on the 08 Vision dyno Air/Fuel graph. The wave on the graph shows the sensor indicating ever-changing O2 conditions of rich and lean. This is indicative of a closed-loop system. In contrast, the fuel injection system used on 2002-2007 Victory Freedom engines is characteristic of a Simplified Speed Density system which uses rpm & throttle position to calculate the fuel mixture. This system is meant to run lean and allow downloaded MAPS and dealer tuning to achieve the optimum air/fuel ratio. The trouble with this is that it leaves room for error (ie. Using the wrong MAPS, a mechanic's skill level, etc.) and can't be controlled uniformly across all bikes dealers. Even the same download can yield different results because of these variables. With a Closed-Loop system, a manufacturer can meet the stricter EPA requirements by adding items such as O2 sensors to relay real time data on fueling needs back to the ECU . The '99-'07 Victorys don't have this ability. Instead, they have a simple pre-map system-yes the correct mapping needs to be in place for it to meet regulation, but that mapping can be altered and change the way the bike runs and pollutes. It has no method of seeing what goes on and communicating to the ECU. 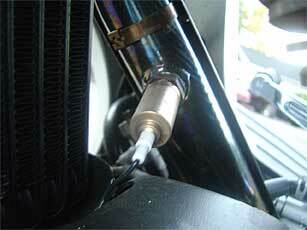 On a closed-loop system, the O2 sensor acts as a Sentry for the exhaust gas. It sees all the gas as it passes. If there's a high percentage of fuel leaving through the back door (the exhaust valve) it relays a message to head quarters (ECU) to turn down the hoses (Injectors). This keeps combustion efficient and pollutants to a minimum most of the time. Conversely, at Wide Open Throttle (WOT ) there is no EPA requirement so the manufacturers have the system pour the fuel to it. Although it becomes a richer mixture, this keeps a motor cooler while running wide open â€”after all, these guys aren't dumb, they know it takes fuel to keep motors healthy under WOT conditions. Below is the fuel curve under WOT in an O2 sensored bike. Looking at the bottom part of the dyno graph, you see that the fuel goes rich, fast, falling to 12.4:1 very quickly from the cruise fuel of 15.0:1. There enough fuel here for a stage 1 up-grade. But only at WOT. All the rest of the Throttle positions are anchored to a limited role. Even though an O2 equipped bike has the ability to see what's going on and control it with a finer degree of accuracy, there still is only enough "buffer" fuel in the programming to just get by if conditions such as temperature, elevation and pressure change severely. My tests show that CLFI Victorys with a stage-1 kit but no download only have the adequate of fuel to handle WOT. At cruise and light throttle they run out of available buffer fuel. Certain closed loop systems can compensate for this but they are the type using mass air flow and wide-band sensors found in very expensive, high performance applications, not the type used on Victory or most autos for that matter. So what does all this mean? Closed Loop Fuel Injection Systems are inherently cleaner and more fuel efficient, yielding better fuel economy and reducing pollutants. And if it's so great, why haven't we seen them on bikes sooner? Well, there's another side to this story. As I like to say, "That's what makes a great answer to pollution, such a tragedy on a Motorcycle." Our cars and trucks are liquid cooled, multi-cylinder, with totally isolated engines and exhaust systems. We don't feel the vibration, the jerk of a 2-cylinder misfire, or slow throttle response. We are isolated from heat and intake & exhaust noises. That's their advantage. So how do we deal with the cards we're dealt? Well, if you want to be an environmentalist. NOTHING. If you want to save your legs from degreed burns, smooth out the throttle response and feel, cut down on the misfires and make more power all you need to do is add more fuel. How do you do that on a closed-loop system? My answer will be out soon. Stay Tuned!